Siberia is always bitterly cold, goes the popular stereotype, and dangerous, brown bears walk its streets. The popular perception about Siberia, that it is a dangerous, difficult place, is far removed from reality. How have these 3 widespread stereotypes about Siberia come about? Anna Gruzdeva, travel writer and native of Siberia, chose the three most prevalent stereotypes about Siberia and tried to view them from the perspective of a person who can see only winter, bears, GULAG labour camps and nothing else. Siberia covers almost 10% of the Earth's land surface, bordering the Mongolian frontier to the south and the icy shores of the Arctic Ocean in the north. It is a land of heroes and convicts, gas-fields, oil derricks, coal and gold-mines, and proudly claims the largest forest cover in the world. Travellers come to Siberia for thrills, adventure holidays, exploration and high-adrenaline activities in the high rocky mountains, forgotten villages and along the Trans-Siberian Railroad. Siberia encapsulates a huge part of the Eurasian continent. If you come to the very north of Krasnoyarsk region in June, to the town of Dikson, for example, you will see snow piles, the icy Kara Sea and people wearing warm jackets – because this is the Arctic. If you visit the city of Krasnoyarsk, which is much farther south in June, you will see students lying in the sun on the banks of the Yenisei River, families with children riding their bikes and roller skating around Tatyshev Island, the city’s equivalent of Central Park. If you don't cover your shoulders from the sun you will get sun burnt. If you go to the mountains of Altai in June, you will be met by a coolness common to spring because you are surrounded by mountains. Many native Siberians love our long winters, despite the -20 and -30 degree temperatures because you can go skiing, snowboarding and ice-skating. Last year the project “I am Siberian” organized an ironic campaign called the White Beaches of Siberia to show that winter recreation in Siberia is more impressive and more fun than its summer activities. 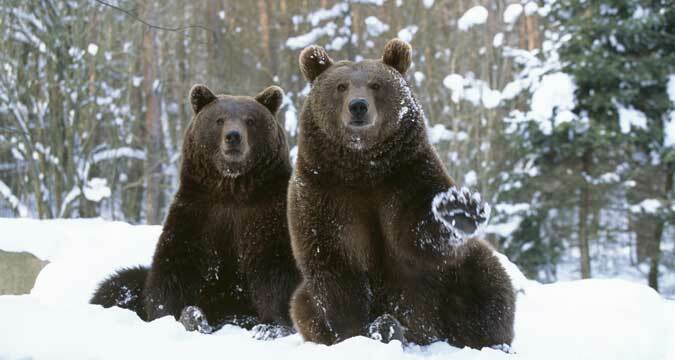 “Bears walk the streets” – this is another popular myth about Siberia. Indeed, there are gigantic tracts of unpopulated taiga forests in our lands where brown bears live and it would be wrong to deny that these club footed carnivores are in some ways our neighbors. But one has to admit that it definitely differs depending on the area. If you go hiking in the Western Sayan Mountains, or make it to the tiny villages of Tofalaria in the Irkutsk Region that is surrounded by taiga, or to the remote Chara Sands desert, the chance of encountering a bear is quite high. But in a big city such as Krasnoyarsk or Novosibirsk it is practically impossible. Yes, from time to time bears appear on the edges of cities. Most often they are forced to approach human settlements because of forest fires or a poor harvest of nuts and berries. In ordinary life though bears prefer not to meet us and this feeling is mutual. It is common to call the bear one of Siberia’s symbols, but this is most likely just a tourist brand type of thing that has developed over the years. If you go to the south of Altai the first thing you will see will be the sky with hovering vultures. If you happen to be in the Dauria steppe in the south of Zabaikalsky Territory, you will find out that the main animals in this area are manuls (also known as Pallas’s cat), roe deer and Mongolian gazelles (dzerens). And if you make it to the North, you will learn that for indigenous peoples the reindeer is the most important animal for them. Sometimes I hear from foreigners who visit Siberia that their relatives tried to talk them out of the trip because Siberia is “a dangerous place.” Presumably this is due to the fact that in Soviet times many GULAG labor camps were located beyond the Ural Mountains and many people suffered. But the Soviet Union doesn't exist anymore, the labor camps have been disbanded and forgotten and many of Siberia’s regions have been welcoming tourists from all over the world for a while now. This is why Siberia is no more dangerous than any other place in the world. Here, just as in Europe, the U.S. or Australia, one can experience warm hospitality, but also run into some troubles. One day you can meet very open and kind people, while the next day you may encounter gloomy and drunk strangers. Remember, this can happen anywhere in the world. Blogger Peggy Lohse, who traveled from Germany to Russia's North, shares her experience: "Siberia is no more dangerous than other parts of the world. People may seem a bit harsh at first, but they are very good in general. Once when I was traveling from Tomsk to Krasnoyarsk through Kemerovo, I had to change the train from Yurga-2 to train Yurga-1. I thought: I can deal with a change, it's a small town. As a result, I was on the edge of town with a large backpack with absolutely no idea how to get where I was going. It was fall. It was windy. I was stranded in the street and was shaking with cold. But the people accompanying another passenger at the station asked if I needed help and eventually took me to where I needed to go to, and even gave me a tour of the city." So, clear your mind of preconceived notions, prepare for new experiences and set off on your personal journey to Siberia.